NBC 5 and the Fort Worth Chapter of Texas Wall Street Women invite you to the 4th Annual Texas Wall Street Women Luncheon on Thursday, November 15, at City Club in Fort Worth. The luncheon, “The Power of Mentoring and Sponsoring Diversity – A Panel Conversation,” will feature great food in a beautiful location, paired with an insightful keynote discussion with a distinguished panel on the benefits brought by women in business. Attendees will also have an opportunity to interact and network with the panel. Proceeds from the luncheon will benefit the Young Women’s Preparatory Network, the supporting foundation of Young Women’s Leadership Academy in Fort Worth. Young Women’s Preparatory Network, founded in 2002, provides a college preparatory education for young girls in Texas from predominately economically disadvantaged families. They have established eight all-girls, college preparatory schools across the state of Texas. Support this worthy cause and reserve your seat today! For more information, visit www.txwsw.com. Texas Wall Street Women (TXWSW) is currently celebrating its 10th anniversary as a 501(c) with over 3,500 members. Over the past 10 years, the organization has held more than 350 educational and networking events and has raised over $720,000 for the Young Women’s Preparatory Network. 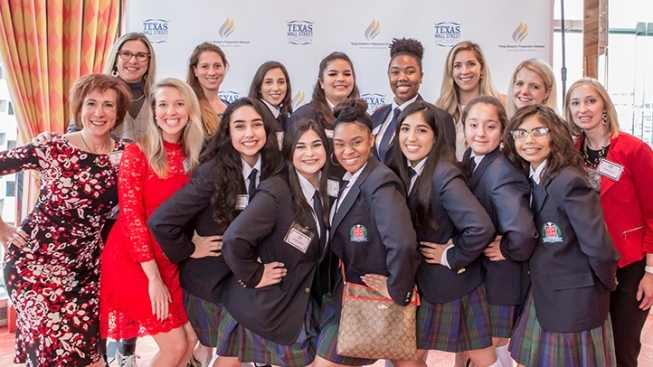 TXWSW is committed to mentoring and supporting women throughout their careers in finance, and making a difference in our communities by supporting college preparatory education for economically disadvantaged girls across the state.